CTI was first tested in a randomized trial with homeless men in a large men’s shelter in New York City in the early 1990s. 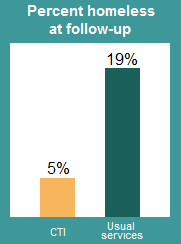 CTI significantly reduced the risk of recurrent homelessness following placement into housing. 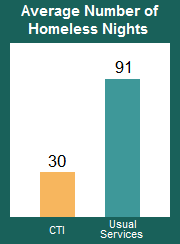 Over the 18 month follow-up period, those assigned to CTI had only one third the number of homeless nights as the comparison group. A decade later, a second randomized trial tested the model with homeless men and women after discharge from inpatient treatment. Once again, a large protective effect of CTI was found on both homelessness and rehospitalization, supporting the model’s effectivenessand demonstrating its applicability to hospital settings. 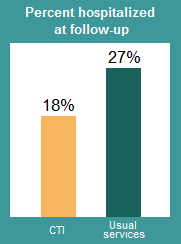 In both studies, the impact of CTI persisted for nine months after the intervention ended. See the Research and Publications pages for further evidence of CTI’s impact.